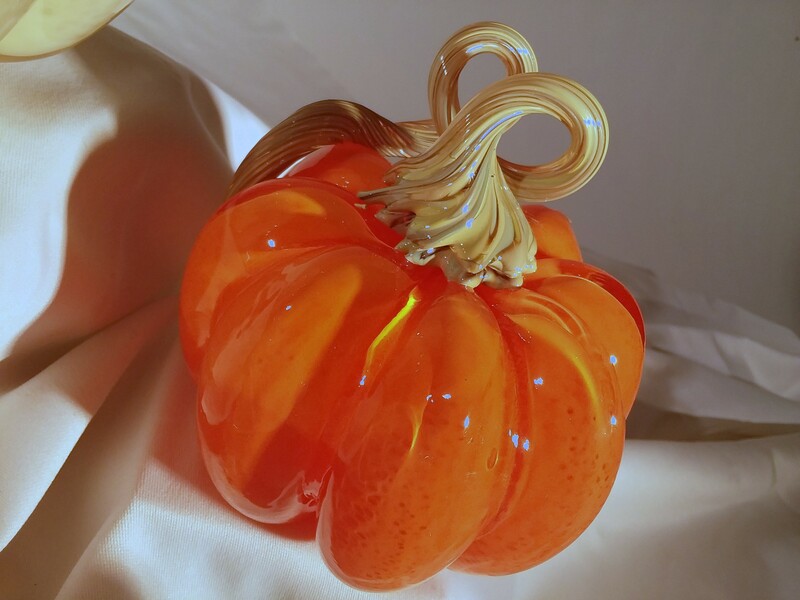 In this class each participant will be guided through the making of a blown glass pumpkin. Instruction is one-on-one which means that you don’t have to wait for a class full of people to open up, you can simply schedule an appointment using our booking calendar which is in the sidebar on this page. You will notice that the calendar is divided into 30 minute intervals, which is about how long most small pumpkins take to make. Small pumpkins are approximately 5 inches tall and five inches wide. Your pumpkin may vary, but this experience can yield a pumpkin of approximately those dimensions. Each one is unique! Pumpkin classes will be held beginning October 1st and will continue to be available until November 19th. Classes can be scheduled weekdays and weekends starting at 10:00 a.m. until the evening (see booking calendar for available time slots which are divided into 30 minute intervals). Please bear in mind that it takes thirty minutes per person and that if you decide to come as a group of, say, six people, there will be a wait of 3 hours for the last participant. In instances such as these, it can be helpful for those not wanting to wait that long to come in closer to their booked appointment time to avoid longer waits. That said, some groups enjoy hanging out at the studio watching all of their friends make their own pumpkin, so we welcome the heck out of our guests bringing in their own food, tunes for our awesome sound system, and enjoy the free Wi-Fi available in the studio while hanging out. Times for making pumpkins are approximate so its possible some bookings will run slightly over while some finish up early. Children of all ages are welcome to the studio. However, it has been our experience that the physical dexterity necessary to successfully make a pumpkin usually means that we begin considering participants at about age 13 and up for the fullest level of involvement in making their pieces. It may be that a child is unable to do certain steps in the process, but would still like to be involved. We once had a five year old who designed her own ornaments, five in all, with her grandparents. She didn’t actually make her pieces, but she was active in choosing the colors and blowing into the pipe to inflate the bubble. She directed yours truly in what to do with the glass pieces including twists and manipulation of the color layer. It was huge fun for her because she got to be the designer/boss. Since every participant receives one-on-one training, we can adjust the level of involvement based on natural physical dexterity. Participants are required to wear comfortable clothing that is not too loose(no scarves, no long shirt tails, etc.) and should be all cotton. Synthetics can melt in the presence of heat, so please make sure that you check your tags of your clothing before you come. We provide you with safety gear needed to protect your eyes, hands, and arms. This class takes approximately thirty minutes to complete. The cost is inclusive, so all color that you would like to use that we have in stock is available to you. Pumpkins need to be annealed, which normally means that they must go through a heating and cooling process that normally tales about 8 hours to complete. As a result, pumpkins made are available the next day for pick-up. If you live locally (Blacksburg/Pembroke areas) and are unable to pick up your pumpkin, we can usually arrange to bring your pumpkin to you within a day or two. Shipping is available nationwide. We reserve the right to adjust a participants involvement in a class based on their own natural skill. For children, this is important because it helps keep them safe when it is clear to our glassblowers that some steps are unsafe for a child to perform. Therefore, we reserve the right to adjust a participants involvement in any class in order to keep them safe. In addition to this, please be aware that glassblowing is a potentially dangerous activity that involves many hazards. One of these is high heat. If you are sensitive to exposure to heat, please be aware that this activity involves exposure to heat and that your ability to communicate to us during your sessions is critical in helping us keep you safe. We provide each participant with eyes, hand, and arm protection during their scheduled session along with instruction about how to keep safe while blowing glass. It will be up to the individual to put this instruction to use. Every minor child must be accompanied by their parent or legal guardian. Feel free to contact us at info@staffordartglass.com or call/text parker at (540) 605-0034. Texting Parker is the easiest way for him to see your message.